Meet your new favorite sandwich! 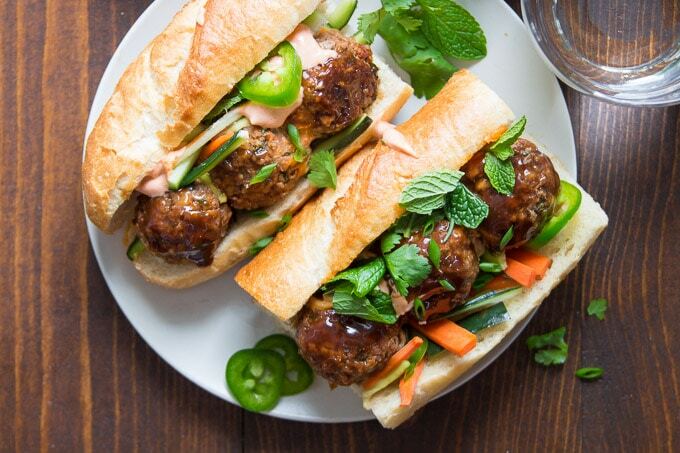 These Vietnamese-style banh mi sandwiches are stuffed with hearty hoisin glazed white bean meatballs, zippy pickled veggies, and creamy sriracha mayo. Totally vegan, super satisfying, and packed with flavor! I remember seeing signs for Vietnamese hoagies outside restaurants back when I moved to Philly. It sounded like a really weird concept to me at first. But then one night I visited a Vietnamese cafe that seemed to be the only place open for a few blocks. There was nothing on the menu I could eat as a vegetarian. I explained this to the server and got ready to leave, when she assured me that they did have veggie food and would hook me up. That’s just what they did, placing a big, beautiful, tofu stuffed sandwich in front of me. This is what my fellow Philadephians had been calling a hoagie, but the correct name was actually a banh mi. Oh man, it was gooooooood. And it was four bucks! I switched apartments a handful of times while living in the city, but every time after that I looked for a place near that cafe, hoping I could stroll down the street for four-dollar banh mis on a regular basis. 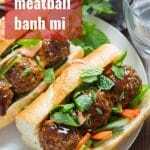 It was only recently that I discovered such a thing as a meatball banh mi. I never really thought about what might go into one of these things other than tofu, so I’m not surprised I missed this. Generally when I veganize recipes I like to make some kind of fun twist on the dish. Meatballs are always fun to veganize. I’d found my twist! Veggie meatballs come together a lot like veggie burgers. You need something hearty and binding to take the place of the meat. Beans usually do the trick! I used cannellini beans here, along with walnuts for texture, some fresh basil, soy sauce and chili paste to kick up the flavor a bit. Mix everything up by pulsing it in a food processor, then roll into balls and bake. When the meatballs are almost done baking, pop them out of the oven and glaze them with hoisin sauce for some extra flavor. 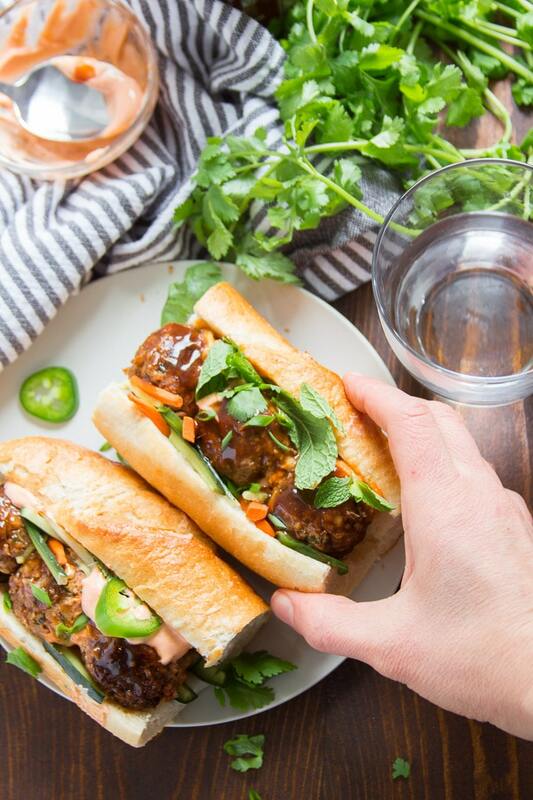 These banh mi sandwiches are dressed with a super simple vegan sriracha mayo and quick pickled veggies — carrots, cucumbers, daikon radish and jalapeños soaked in some water, rice vinegar, salt, and sugar. If you have time, I recommend making the veggies a day ahead of time. If not, go ahead and mix everything up while the meatballs bake. Stuff everything into baguette sections with some fresh herbs, then enjoy! Good bread is everything! Make your sandwiches on a nice quality fresh baguette. Save time on the day of serving by preparing the bean mixture for the meatballs a day in advance. Then, on the day of serving, just roll and bake. 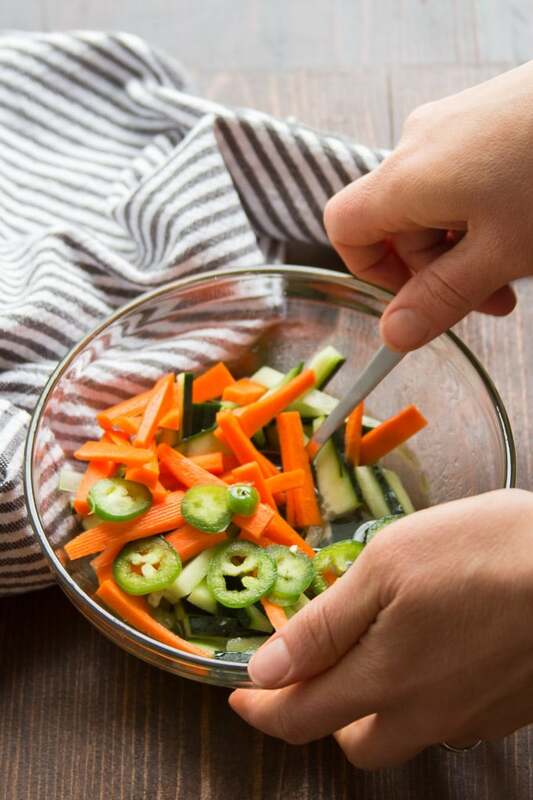 Also prepare the pickled veggies ahead of time — in fact, they’re better this way! Can these sandwiches be made gluten-free? Yes, with a few substitutions! Use a gluten-free baguette, gluten-free tamari instead of soy sauce, a gluten-free variety of hoisin sauce, and gluten-free panko breadcrumbs (oat flour might work as a substitution too). Are these spicy? The chili paste, sriracha, and jalapeño peppers give it a little kick. If you’re not into spicy food, just leave these ingredients out. Is there any way to reduce the calories in this recipe? It is on the highish end, calorie wise, and it’s meant to be indulgent. But if you’d like to cut back a bit, try using less walnuts in the meatballs and less mayo. You can also put fewer meatballs in each individual sandwich. How about reducing the sodium? Try low sodium beans (or cook them from scratch — you’ll need about 1 3/4 cups), low sodium soy sauce, cut back on the salt in the pickled veggies, and go easy on the hoisin sauce. Meet your new favorite sandwich! 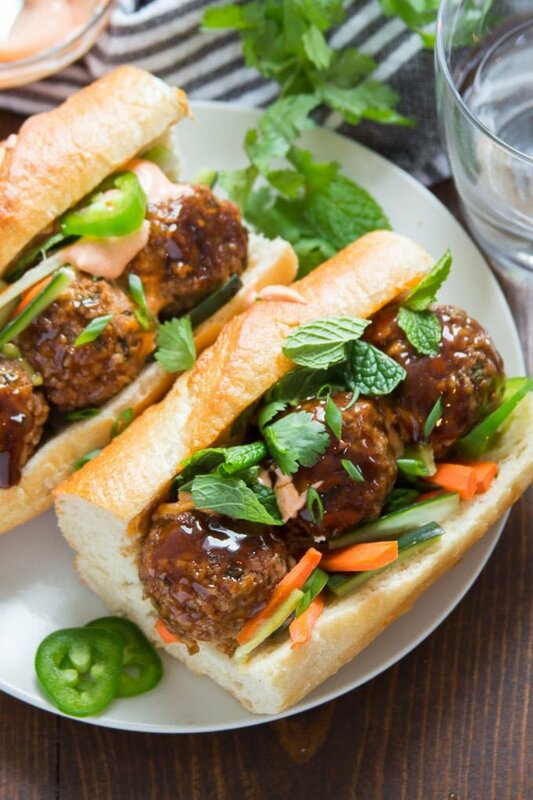 These Vietnamese style banh mi sandwiches are stuffed with hearty hoisin glazed white bean meatballs, zippy pickled veggies, and creamy sriracha mayo. Totally vegan, super satisfying, and packed with flavor! Preheat the oven to 400º and lightly oil a baking sheet or oven-safe skillet. 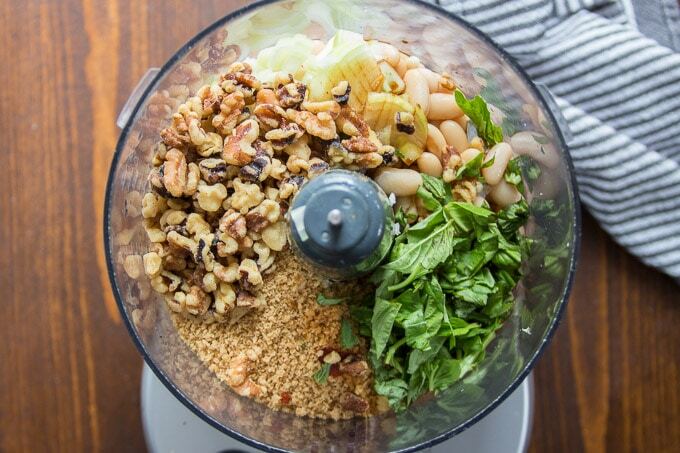 Place the beans, walnuts, onion, garlic, panko breadcrumbs, basil, soy sauce, sambal oelek, rice vinegar, and liquid smoke into the bowl of a food processor fitted with an s-blade. Pulse until the ingredients are finely chopped and well mixed. Roll the mixture into 1-inch balls (about 16 of them) and arrange them on the baking sheet. 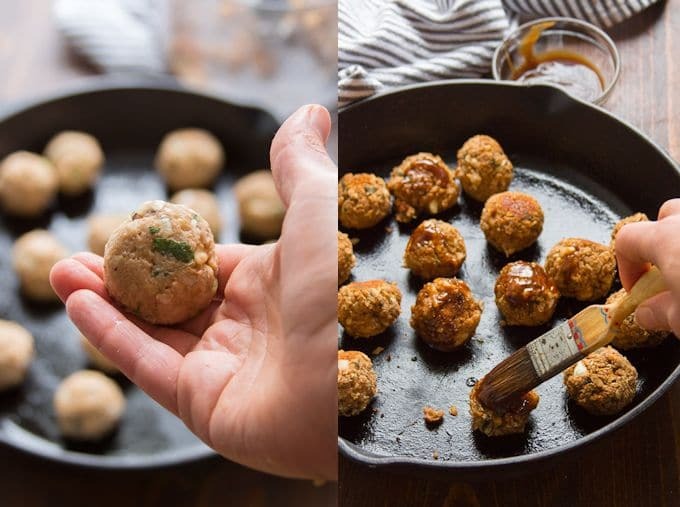 Brush the meatballs with oil. Bake for 25 minutes, flipping once to achieve even browning. Remove the meatballs from the oven and brush them with the hoisin sauce. Bake for 5 minutes more, just long enough to set the sauce. In a medium bowl, whisk together the water, vinegar, sugar, salt, and sesame oil. Stir in the carrot, cucumber, daikon and jalapeño. Allow the veggies to soak for at least 20 minutes, or up to 2 days. Stir the sriracha and mayo together in a small bowl. Adjust the amount of sriracha to taste. Slather the inside of the baguette sections with sriracha mayo and stuff with meatballs. Top with pickled veggies, cilantro, mint, and scallions. You can prepare the veggies a day ahead of time. Totally not necessary, but it will give them a chance to soak up the flavors. I am eating a tofu bahn mi for lunch as I read this yummy post! I will have to try!! I keep tofu marinating in my fridge all of the time and I love to use it for bahn mi. My sauce is yogurt, sriracha, garlic, onion powder and salt. These meatballs would be a great variation for the tofu. I so wanna eat this! Thanks for the recipe. Though, you have the spelling of the name incorrectly, it’s actually spelled “Bánh Mì”… the ‘h’ is after the ‘n’, not before. Our house nut-free due to allergies. What else could we substitute in the meatballs instead of walnuts? You might be able to use sunflower seeds – I’d just chop them up in the food processor first and make sure they’re unsalted. You can also leave the walnuts out. They add texture but I’ve made batches of these meatballs without them and I still loved them. Enjoy!! This may be a silly question but are the meatballs meant to be hot in this sandwich when you eat It? Thank you. They’re best hot, but still good cool. :) By the time I finished photographing the sandwiches in the pictures they had cooled, but my husband and I still loved them. Looks bigger than 1 inch in photo. I suppose could for 1 inch and half or 2 inch. I bet good with data melt on and ranch vegan dressing. My meatballs turned into pancakes. What did I do wrong? Oh no! Do you mean they flattened out when you baked them? My best guess would be too much liquid, which could happen if you don’t drain your beans enough, and/or overblending the mixture. It should have some texture and firmness to it – if you find it’s too loose when you roll your meatballs, try adding some extra breadcrumbs. I made these for dinner this evening and they are seriously yummy. I substituted the can of beans for a small block of tempeh instead and just used whatever other sauces and spices I already had to hand. So easy and super quick. 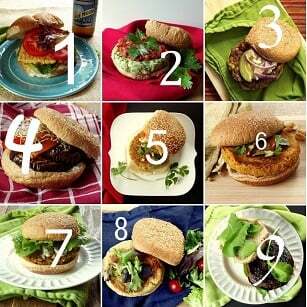 Great idea to use tempeh! I’m so glad you enjoyed them! Thanks Ella! I made this today and loved it! At first I blended the meatball mixture too much so I added more breadcrumbs and it worked great. Yay! Good save and I’m glad you enjoyed it! Thank you! They should freeze well! With recipes like this, I like to freeze the bean mixture before rolling and baking, but they should also be fine if you freeze them after they’re baked. Enjoy! Thanks! I ended up freezing them rolled pre-baking, they tasted delicious but they were very crumbly (even before I froze them). Might try adding a flaxseed egg or something next time, great recipe otherwise! Btw I never commented before but I visit your blog often and it’s amazing, very creative, keep going!! Thanks so much Victor! I’m glad you enjoyed them! A splash of water might do the trick if the mixture is crumbly next time.